I am both passionate about and excited to be practicing in this new era of dentistry. But what I have been most passionate about in my 20 years of practice has been providing world-class outcomes for our patients to keeping them healthy for a lifetime. There is nothing more satisfying than creating beautiful smiles for my patients. By having a complete understanding of a patient’s condition I can make an accurate diagnosis of their oral health, which allows me to clarify with a patient the current state of their health. When a patient both understands and sees what is going on in his or her mouth, that person becomes empowered to make the best choices for treatment that meet their needs for the health, longevity, and the appearance of their smile. I get charged at the beginning of every day knowing the positive difference me and my team will make in the lives of people. On occasion, patients can become overwhelmed with their new ability to chew and enjoy food or to smile with confidence. These transformations empower our team to do the best that we can for our patients. A native of Honolulu, HI, I received my Bachelor’s of Science degree from the University of Oregon in 1988. After graduation, I moved to Portland, OR to attend the Oregon Health Sciences University School of Dentistry. In 1992, I earned my Doctor of Dental Medicine degree. 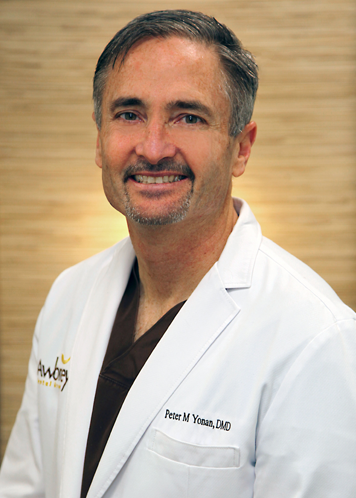 Following a one-year residency in San Antonio, TX, I moved to Bend to open Awbrey Dental Group. I participate in continuing education to make sure I am always at the top of my game. What professional athlete can command a number-one ranking without an unending commitment to hone their ability? Ultimately, it is my patients who win when I am able to provide them both world-class diagnostic skills and clinical outcomes. Health, longevity, confidence, and a natural smile are what our patients experience with a team that is dedicated to continuous and never ending improvement. I am a proud father of two wonderful children, Mari and Luke. When I’m not in the office perfecting smiles, I enjoy outrigger canoe paddling, cross-country skiing, cycling, and running. My family and I love to go up to the Gorge during the summer on the weekends to paddle, cycle, and hike. Committed to giving back to my community, my team and I donate our skills once a quarter to provide dental care for low income children. I am also on the board for the Boys and Girls Club of Central Oregon, which helps to create an environment of support and caring for youth. Through this support kids are less likely to drop out of high school, go to college, gain confidence in themselves, and in turn give back to their communities where they live. I truly believe making our community a better place to live benefits all of us. A healthy community is a happy community.